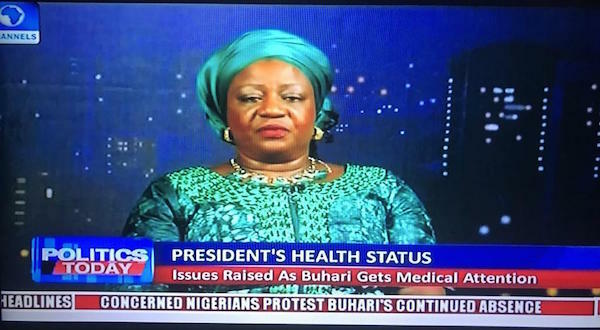 Ms. Onochie said this during an interview on Channels TV Monday evening. She said: “For the life of me, I have no idea why anybody should disrespect another by asking for the details of their health status. As we speak, we have an acting president. As we speak, President Buhari seems to be like a private citizen at the moment. We have no right and it is very disrespectful for anyone to ask for his health status. In the UK where I came from nobody would release anybody’s health record to another, not even the members of their family unless the person decides to approve. ““The President has acted constitutionally; he has not broken any law, any rule or any constitutional provisions in our nation. The prerogative to speak on his ailment lies only on President Buhari. If he chooses, it is a choice. It is very disrespectful and very intrusive. We are intruding into his private rights. He has rights too as a citizen of Nigeria. It is not right, not appropriate. Anybody can get sick at any particular time, ” she added. Buhari is not a private citizen. A private citizen should not be using Abuja house in London and should not park a Presidential plane in London for over 90 days and thereby incurring high packing fees. Common!